Alex’s experience with painting and decorating at home developed into a desire to pursue a career in the industry. She had studied Art, but didn't want to stay on for Sixth Form, and discovered the Apprenticeship path - choosing to earn whilst learning. Her work at Mercer & Mercer is supported by College studies, where she is able to study processes in more depth. 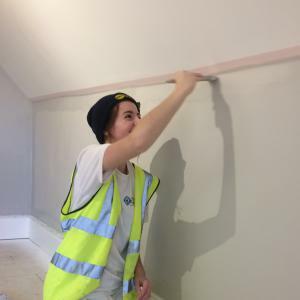 Like all other Apprentices, she spends one day week at College, developing knowledge of health and safety, and specific techniques, which can then be put in to practice in the workplace. Alex shared how she enjoys being in a small class, which offers "more dedicated and focussed support." Explore our Construction courses or book onto our next Open Event!